Standing on the sidewalk in front of this charming Brookwood Hills home you will think you are about to step foot into the perfect little cottage. 324 Camden Road is perfect, but it is certainly not little. Spacious and diligently renovated you will be speechless when you discover all the wonders of the 1964 home. Step through the red front door and you will immediately realize the home is much bigger than it appeared. 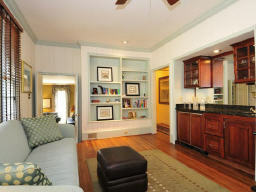 To your left is a formal dining room and to your right a front living room with built-in bookshelves and a fireplace. The room has two floor-to-ceiling windows on each end. You can enjoy the openness the windows create as the natural light falls into the room. A back room that was most likely originally paneled in dark wood has been painted white with charming contrasting trim. The room has built-in shelving and a new custom built wet bar. The addition of the bar will make having an impromptu party a breeze. Everything you need is right here in one place. The current owners also use this space as a place to relax and watch TV. It is also easy to tell the person that remodeled this house likes to cook and entertain. The kitchen is not only highly functional, it is extremely appealing. Dark stained cabinets, granite countertops, tumbled tile up the walls and a lead glass window will tantalize your senses. 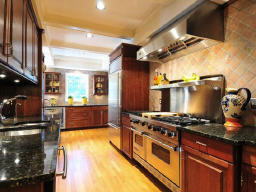 Viking appliances, including a double range with double ovens, might make you think you are in a top chef’s kitchen. A separate beverage refrigerator will help make ample room for all of your masterpieces in your Sub-Zero refrigerator. This room may make a chef out of even the most challenged cook! The master suite will accommodate a king size bed, dressers/chest of drawers and a sitting area. The walk-in closet is tucked neatly into a corner on the way to the bath. Separate sinks are encased in antiqued cabinetry with multiple drawers and cabinets. There is a separate shower with frameless glass doors and a whirlpool tub. 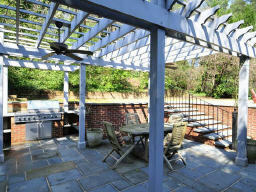 The first floor provides easy access to a bluestone tile patio covered by a trellis. A built-in gas grill and cooking station make outdoor entertaining just as easy as indoor entertaining. Access to the remaining yard can be reached by a few stairs connected to the grilling and dining area. It is truly remarkable what has been done with this property. So much has been added without taking away from the beauty of the original structure. 6690 Riverside Drive is a sprawling home on six acres overlooking the Chattahoochee River. Built in 1967 and nicely renovated it is more than move-in ready. All the rooms in this five bedroom, four and a half bath home are oversized. So much space and natural light to take advantage of here you will have room to grow. You will always welcome guests with this much space. Hardwood floors run throughout the majority of the house. The family room, breakfast area and kitchen are open and allow for easy conversation and wonderful outdoor views. The master suite is on main floor and has so much to offer the owner. A large bedroom with fireplace lends itself to a spacious seating area. There are his and her baths with features such as Jacuzzi tub and frameless glass shower. It doesn’t end there though, there are extensive built-ins within the suite and a spacious office with built-in cabinetry. It may be possible to never leave your suite. The remaining bedrooms are upstairs and many are large enough to double as bonus, play rooms or a spectacular guest suite. With all this space the options are only limited by what you can dream up. Situated on such an awe-inspiring piece of land, outside living is almost as important here as inside living. There is a front patio that allows a great view down the drive, but the gem here is found on the back of the home. A large stone patio under a vaulted roofline looks down towards the river overlook. The stone chimney from the inside fireplace easily divides the space. There is ample room for a conversation and dining area. The space lends itself to outdoor entertaining. Congratulations to Bill Ransom, who won the Chick -Fil-A drawing for office delivery of breakfast. Bill was at an inspection for a home when the friendly cow arrived, so the REALTORS at Atlanta Fine Homes Sotheby’s International Realty enjoyed the goodies in his absence. Pictured here with the Chick-Fil-A Cow is George Heery and Jackie Sanford. Submitted by Bill Ransom, REALTOR®. Mortgage applications were up as rates fell for the week ended July 10, according to the Mortgage Bankers Association. Applications rose 4.3 percent from the previous week on a seasonally adjusted basis. However, they were down 2.7 percent compared with the same week a year ago. The portion of mortgages that were refinances increased to 54.9 percent of the total applications from 48.4 percent, while the adjustable-rate mortgage share of activity rose to 5 percent from 4.4 percent of total applications the week before. For the entire story from the Atlanta Business Chronicle, please click here. Atlanta has made the cut of 37 American cities that will bid to host soccer’s World Cup matches in 2018 or 2022. The USA Bid Committee on Tuesday said it issued requests for proposals (RFPs) to officials representing 37 U.S. cities, including Atlanta, that currently qualify as potential host cities to FIFA World Cup. The RFPs ask for information from city officials about tourism, climate, security, transportation, promotion and more. The United States’ application is due to FIFA in May 2010. FIFA’s 24-member executive committee will study the bids, conduct site visits and name the two host nations for the 2018 and 2022 tournaments in December 2010, completing a 21-month bid and review process. For the entire article from the Atlanta Business Chronicle, please click here. Set amidst the setting sun over the Atlanta skyline, the Top Performers of 2008 of Atlanta Fine Homes Sotheby’s International Realty were honored with a dinner at NEO and a cocktail reception in the finished model on the 42nd floor at The Mansion on Peachtree. In attendance were the more than 30 top agents from the company, including top 10 agents Wes Vawter, Wendy Zoller, Heery Brothers, Tina Hunsicker, Leslie and Bill Ransom, Margaret Cox, Frank Wynne, Peggy Hibbert, Tom Hicks, and Burma Weller. Key managers also attended the dinner including Jenny Pruitt, David Boehmig, Nancy See, Mike Bugg, and Janet Blanton. Located on a quiet cul-de-sac in Historic Brookhaven, this home at 931 Club Station has been meticulously maintained, tastefully updated and beautifully decorated. Gracious elegance and charm describe the formal dining room and great room, both with French doors opening to the private back yard. Featuring a master bedroom and luxurious bath on the main level, this home is in “move in” condition. The kitchen has been renovated with a SubZero refrigerator & Viking appliances. Upstairs offers additional 3 bedrooms, 2 full baths, a bonus room and office with built-in cabinetry. The gorgeous lush perennial gardens with pond and water fountain were featured on the Atlanta Botanical Gardens for Connoisseurs Tour. Small in size but huge in charm this home is a perfect 10! 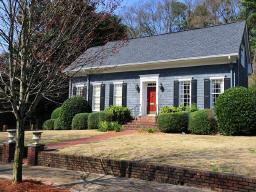 This French country home is located in the coveted close-in Atlanta neighborhood of Historic Brookhaven. Brookhaven is a neighborhood that was developed in the early 1900’s for prominent Atlanta families and is distinct for being the first neighborhood in Georgia designed around a golf course. Neighbors can be seen walking, jogging or cycling around the neighborhood at all times under a beautiful canopy of mature hardwood and pine trees. Also within walking distance are many upscale shops, parks and the Brookhaven MARTA station.